[MARCH 2, 2000] Although a Middletown landmark is gone, folks who miss it will soon be able to see it restored to all its former glory. The small, white gas station with the big canopy that sat on the corner at 105 Fifth St. in Middletown for more than 60 years will be only a short drive away. In a few months it will become a featured attraction in a collection of automobile service station memorabilia in Springfield. It will even display a sign similar to the one that might have been there 60 years ago: Mahan’s Filling Station, Middletown, Illinois, USA. Bill Shea of Springfield, a collector of many types of artifacts from the early days of automobile travel and a dedicated member of the Route 66 Association of Illinois, bought the building from John Mahan of Middletown. He recently moved Mahan’s to his former service station, now a private museum of Route 66 memorabilia, at 2075 Peoria Road in Springfield. Peoria Road, which becomes Ninth Street a few blocks south of Shea’s place, was once "America’s Main Street," Old Route 66. To honor the family that formerly owned and ran the old Philips 66 service station, Shea is having the embossed metal sign made using the family name. Along with his son and two grandsons, Shea will restore the 14 by 14-foot building, repaint it in its original colors, and fill the inside with artifacts from the days when it was operating. "I’ve bought an old stove and chairs and a khaki uniform like the attendants used to wear," he said. "I’ve even got a real old soda sign, a thermometer with an ad for Nesbitt’s California Orange." The metal station will be in the company of many other historical items such as gas pumps, including the very old type with the glass bulb at the top, a dozen old cash registers, oil company signs, an 80-year-old peanut dispenser, a fifteen-cent-a-pack cigarette machine, and an oil company pump jack, which pumped oil directly from the ground. "We don’t have a lot of new things. We just have old things that look new. There’s nothing here that you could buy at WalMart," Shea says. These and the many other items he has collected and saved over the years have brought Route 66 fans from all over the world to his private museum. Three television stations, Channel 47 of Peoria, Channel 2 of St. Louis and the public television station in Boston, have filmed his museum. Shea and his wife, Helen, have been featured in People magazine, the Chicago Motor Club magazine and they frequently appear in the Route 66 publication. He reports that in June a busload of people from the Chicago area will be coming to see his place. "I’ve been on Old Route 66 practically all my life," Shea says. "I was born only a block and a half away from it. I had a gas station here for forty years. I don’t know of anyone who’s been on Route 66 as long as I have. Everyone in my family is a lifetime member of the Route 66 Association. We’re part of it and it is part of us." 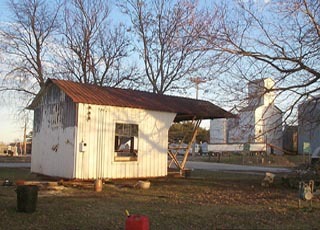 Although he has traveled around the country buying Route 66 memorabilia, this is the first building he’s ever purchased. "I was really tickled to death to get it. I’ve never seen a metal building like that still standing anywhere. We’ll sand it and clean it and put windows back in—whatever it needs." The little service station has been a part of the Mahan family’s history for as long as they can remember, say Mahan and his sister, Carolyn Seitzer of Lincoln. The family has a picture dated 1939, of the building in its Middletown location. The picture shows a pump with a big glass globe at the top, the type commonly seen before electric pumps came into use in the 1930s. The gas was pumped by hand up into the globe, then allowed to flow down into the automobile’s gas tank, Seitzer says. "Dad bought it and moved to Middletown before World War II. He ran it as a Philips 66 Station until he went into the Army. When he came back he ran it for years. 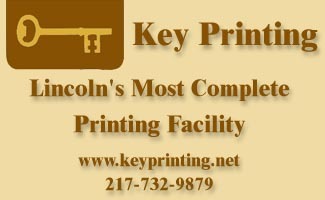 He probably closed it in the mid-1950s," Mahan remembers. "I didn’t think anybody would ever want it," he added. "I never used it for anything but storage. Shea approached me about two months ago. 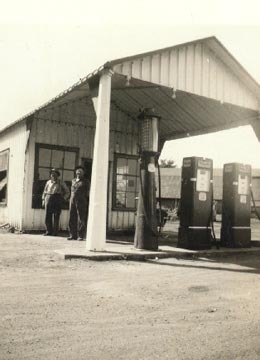 He said it was probably the oldest filling station he’d ever seen. "I’m surprised anyone would go through what he did to get it out of here. After he bought it he jacked it up and built a trailer underneath it to get it to Springfield. He had two guys and worked two full days doing it. I’m glad it got a good home. I’ll go down and see it when it’s restored." 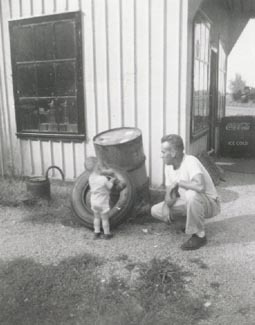 Seitzer remembers how hard her father worked when he was running the service station. 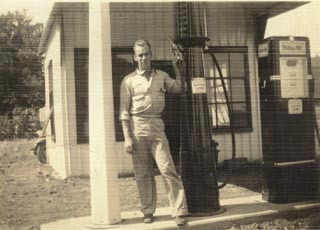 "He was there ten or twelve hours a day, and when he went home people would wake him up at night to pump gas for them. For a while it was the only gas station in Middletown. We lived in a house right next to the station and we had a hose running across the driveway hooked up to a bell in the kitchen. If the bell rang, my father would put down his coffee cup and go out to pump gas. "He changed oil and tires by hand, and he sold fan belts, plugs and points, gum and candy bars in the station," she remembers. Her father finally had to give up the car repair business because a World War II knee injury became worse and made getting under cars impossible. Seitzer said she’s heard people in Middletown say, "Oh, the station’s gone. That corner just doesn’t look right." But, Shea will welcome all those folks to his place in Springfield. "We don’t sell anything and we don’t charge anyone to come and look around. We’re open from about 7 a.m. to 4 p.m. weekdays and until noon on Saturday. We’re not open Sundays." When the station is restored, Shea, a veteran of World War II who participated in the invasion of Normandy on D-Day, plans to put up a second sign. It will say, "Open Soon, Under Old Management. Hiring June 6, 2000."